A sea of blue unfolded before my eyes, every time I walked to the shops near the harbour. A blazing sun, clear sky, with a shade of crisp clean blue that was Mediterranean-esque. As you reached shade subtended by the buildings, you were welcomed with a step change in temperature and greeted with a cool and comforting breeze. This was Sharjah, the quiet little emirate in the UAE. The year was 1991, not so distant past but with a lifestyle of a bygone era. No cell phones, no computers, just an Atari console that was allowed to us during our school holidays. We used to live just off Al –Mareija Street in an old housing colony. I don’t remember the sweltering heat, as that was perhaps the least of my concern at the age of 11. However, I do remember that due to overtly bright sun, as we entered our home coming from outside, it took a while before our eyes adjusted to room light. We would be home by 2:00 pm from school and were only allowed to play outside after 5:00. This was to avoid sunstroke and the heat to cascade. In between we would have our lunch and my mum would have her siesta. Me and my siblings would wait for the cartoons to start just past 4:00 pm on channel 33. For us it wasn’t just a TV channel, it was our portal to topsy-turvy dimension. Dubai Channel 33 had a certain love affair with Hanna- Barbera cartoons, it played them all the time. The entertainment kept us grounded till was cool enough for us to go outside. Sharjah must be the ideal place to raise kids at the time with hardly any crime, little traffic and a death rate, that was the envy of the world. In that perfect world of mine, it was the cocktail of Tom Sawyer, Enid Blyton and all those Hanna–Barbera cartoons that had intoxicated me with a burning desire to have an adventure of my own. And so every opportunity I got, I would be off on my bicycle venturing far and away. It was music to my ears when mum would ask me to get some grocery. Even more so, when she would ask me to get puff pastry, as it meant going further afield to a distant shop. And it was one such trip to that shop, that lead me to my most cherished memory. As I headed back after groceries (puff pastry included), my eye caught an object by the window of stationary shop. It was a geometry box but it wasn’t anything ordinary, it was an Oxford Helix geometry box. I was transfixed, stopped cold in my tracks. Perhaps it was the name and prestige of Oxford that had captivated my attention. To me Oxford meant books, scientists, mathematicians and pinnacle of excellence. And boy I wanted to feel like a scientist. 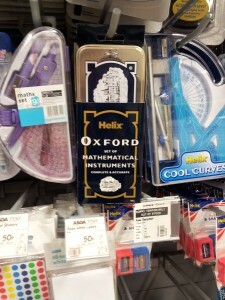 I wanted to be a part of Oxford. And there it was, a shiny tin box with cardboard wrapping with the name Oxford stamped on it. Boy o boy, I wanted it. Talk about love at first sight, for me this was it. The price tag on it said “4 Dhs”. That wasn’t the problem though. I could muster that in savings in a few days. The problem was……. “it was complicated”. But bear with me and I will endeavour to explain. When I reached the 6th grade i.e. the first year of my secondary school, I was excited for two reasons. The pencil was to be replaced by a pen. And the pen strictly had to be a fountain pen and not a ballpoint. The second reason was that I had to move to a new school building. A basketball court, a cricket field, a football pitch awaited. This was it, my transition from boy to a man. I inherited the pen of my elder cousin and also his old geometry box. And so already having the things that I needed meant there wasn’t any excuse to buy a new one. And that my friend was the problem. In this day and age it would sound silly, but that was the value I was brought up with and it was a test of my integrity. Every now and then in the evenings I found myself cycling to the stationary shop, just to catch a glimpse of that geometry box. It was to assure myself that it was still in stock, it was still there. After I would have ogled it to be my heart’s content, I would rush back to my home. I lost count of the number of times I made this pilgrimage. In the middle of it all operation “Desert Storm” started. Call it my foolishness but I wanted it to happen, badly. There was a reason behind this inadverent death wish. My mum had told me stories of the 1965 war between India and Pakistan. She told me how when the sirens wailed, everyone had to rush inside, switch off the lights and sit quietly through the blackout. The thrill seekers of the time would get on the roof to smoke, while the elderly would try thier best to hold them back. The cigarette gave off enough light to be picked up by the bombers, I was told. My mum told me how she knitted woollen sweaters for soldiers and people rationed food. I was fascinated by her stories and secretly hoped to see at least one war in my life time. Too naive to know the perils and horrors of a conflict, to me it was all a part of an adventure. It wasn’t long before Iraqi Scud missiles reached Saudi Arabia, which heralded the arrival of US warships at our harbour. When I learnt about it I rushed to the docks, hoping to see aircraft carrier with F-14s. Yes, you guessed it, it was the Topgun syndrome. To my disappointment, they were only two small frigates. Channel 33 was now airing war anthems and patriotic songs instead of cartoons. I found that okay initially, but soon my flavour for the war began to sour. A flood of Kuwaiti migrants, fleeing the warzone had arrived to the UAE. I was hoping to get days off from school but that never happened. I thought the operation might be over in days but that didn’t happen either. Life carried on, with the same strawberry-milk and butter jam sandwiches for school lunch and very little TV. And I carried on going to the stationary shop for the reassurance, lest a stationer’s run. An year passed, I was promoted to a higher grade. By now my own geometry box had almost passed its shelf life. The start of new session meant buying brown paper for the jotters, plastic laminate covers, a bottle of Pelican ink and sticky tape. We went to our usual start-of- the-year stationers. It had loads of geometry boxes but not the one I longed for and so I remained quiet. For it was the fear that my mum may ask me to buy a box I didn’t want. And amidst that psychological turmoil, I saw it! It was lying underneath a stack of other boxes. 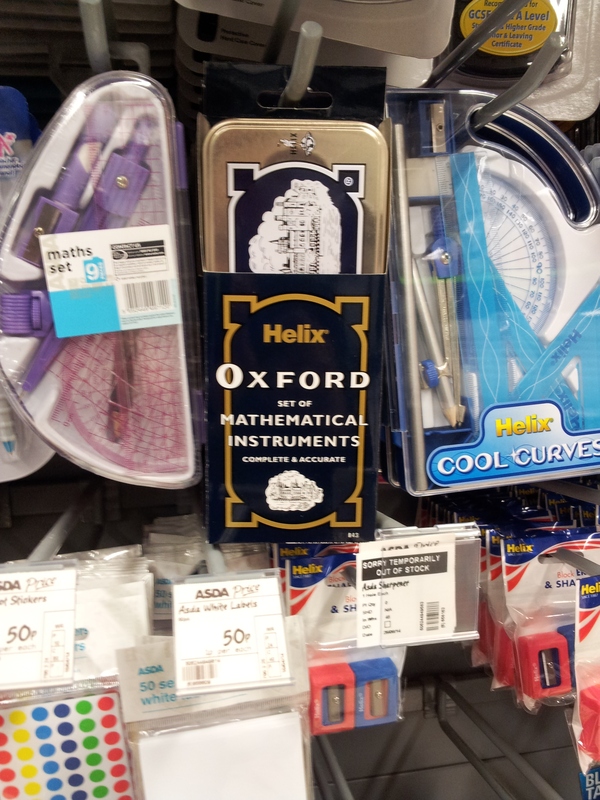 It was the Oxford –Helix geometry box. So excited was I, that I pulled it, only to witness the boxes on top of it to collapse. Luckily I didn’t break any. I had to dash because payment was now in progress. With a pounding heart, I summoned all my courage to and ask my mum if I could get this? “Of course you can” was the answer, and that was it. A bit of an anticlimax to the end of a saga. It didn’t matter, what mattered was that I had it, I had my geometry box. I smiled days on end, looked forward going to school and was eager to use it any chance I got. This was my breakthrough to Oxford and I had it in my pocket. I felt I had almost graduated for it. Fast forward 23 years and I am walking in an ASDA superstore in Edinburgh, UK. Lo and Behold! I came across the same geometry box. I held it for while, remembering all that time I once waited to acquire it. In this day and age when we are consumed by consumerism, I wonder if our children could ever feel what it means to long for something? Would they get such a buzz from something so ordinary? In terms of value for joy, that must be the best 4 Dirhams ever spent. I am glad I waited for it, as not only it heightened my sense of anticipation but also gave me a warmer feeling of equity. Oh in case I forget, I also got the Cambridge dictionary next year.